Our October newsletter went out last night. If you haven’t recieved your email yet, please contact us us and we’ll send you the URL for the newsletter. The winning slogan for the September contest is: Greyt Designs, Outstanding Style! More details can be found in the October newsletter. We’ll change over to the new slogan sometime within the next few weeks. Greyt Inspirations home page has a minor change. We have added a rotating slideshow at the top left instead of a static picture. If you would like your dog, any breed, added to this slideshow, please feel free to send us the photo. For a limited time, we are accepting new pictures (until the slideshow gets too large). We love all dogs! This morning, while checking up on a few things online, I came across a fantastic website that I have never seen before. Check it out: http://www.trunkt.org/ . It has some gorgeous stuff listed (make sure you have at least an hour to browse – there is lots there)! I know I’ve said this before, but it is something that I really, trully love. Sitting on the couch with a dog on cuddled on each side of me on Saturday mornings. Remember the huge bones that our dogs got last weekend? Somehow, they managed to break it in half ! Unbelievable! I’ve been for my haircut this morning, now I need to get to work on filling orders before we leave for Dewey (Greyhounds Reach the Beach) on Wednesday. and it’s only half done! Got up at the usual time (O-Dark-30) and drove my husband into work. Continued on and drove son #1 to the dentist. Got home at 10a.m., had something to eat, tried to log-on to work – not able to log-on. Packed up, drove to the office to work – where I am right now (just taking a short break). After work, we have go pick up our repaired cell phone and shop for groceries; fitting in something to eat before shopping so that we don’t pick up extras. We’ll get home between 7-7:30 and I’ll have to spend some time catching up on Greyt Inspirations work. Then, maybe I’ll get to relax and watch some of the new shows and continuation shows that are on tonight. This may very well be the last nice day of the year. We had a beautiful, warm, sunny Sunday today. The dogs all enjoyed most of the day lounging outside. I was inside, working on getting products ready for Greyhounds Reach the Beach which we are vending at the first weekend of October. I’m almost ready, just a few more things to finish up. All in all, it was another quiet Sunday…Hope you had a very nice weekend too. I have had to change to look of my homepage once again. I tried something new last time in the hopes that it wouldn’t make much of a difference but after a few weeks, I noticed that it was having a negative effect. It’s really too bad because I really liked the look of that page but the new and improved webpage is quite nice as well. I hope you like it too. I would be very open to any comments or suggestions you may have. Please feel free to comment. Our September Contest ends at midnight tonight. If you haven’t entered and have a great idea, please submit it today. We’ll be reviewing all the entries and Hopefully will find a suitable entry and a winner. Thanks to everyone who has submitted an entry. We really appreciate it. Yesterday, we bought some beef bones for the dogs. That is something that we do regularly, they LOVE them and it keeps there teeth clean. The butcher we buy the bones from was busy yesterday when we stopped in to get some and he only had a few for us. One of them was quite huge, the others were of normal size. We gave the bones to the dogs, and gave Shadow the “big” one since he is usually the most enthusiastic about the bones. Shortly after starting on the bones, it was their supper time. They all came in, ate their suppers quickly and Mandy was the first one back outside. She immediately took the “big” bone. Shadow followed very shortly after, noticed that Mandy had taken “his” bone and stood there looking at her. He would not eat any of the others – I guess they were just not good enough! He didn’t know what to do, just kept starting at her and standing nearby. 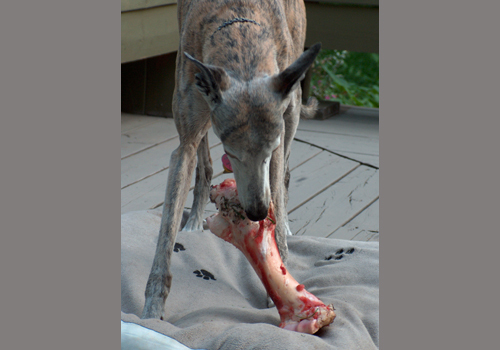 A little later, Mandy left the bone to go get a drink of water. Shadow grabbed it and started eating it. When Mandy returned, and noticed that Shadow had the bone, she walked up to him, stuck her face in his, growled and snarled at him. As Mandy is the “alpha” of our pack, Shadow did the right thing and walked away from the bone and Mandy resumed her treat. That was the first time we have ever seen her so obviously show her “alphaness”, she is normally a very subtle alpha. We are amazed that the difference in bone sizes makes that much of a difference in their attitudes. 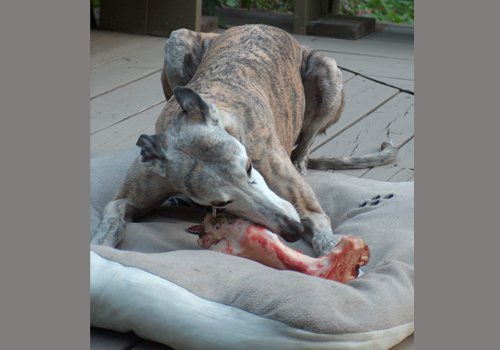 The “big” bone was obviously the “bone of choice”. There is one day left in our September Slogan Contest. Don’t miss out on your chance to win a martingale dog collar or an embroidered t-shirt. Submit your slogan entry to us before midnight EST on Saturday. We have added some new articles over the past few days.